What's in the Corner? A Muffin "Tail"
Laura W. Eckroat has done it again. Muffin has done it again. What have they done? Answer: They have teamed up to craft another Muffin tail, What’s in the Corner? This is a humorous little song with a big message about what Muffin, the rescue dog from Went Out to Get a Donut…Came Home With a Muffin, sees in a corner. Mrs. Eckroat’s newest rhyming book is so descriptive that you will be able to picture in your mind’s eye as Muffin conscientiously investigates that corner trying to figure out what is there and protect her family. And you will have fun trying to guess what she sees in the corner. I am not going to spoil this sweet rhyming, sing-song story about a very sweet puppy. You are going to have to read it to uncover the mystery. When you get the book, you can even download the audio for it and join Mrs. Eckroat as she sings this lovely rhyming book. The colorful illustrations by Greg White make this new Muffin experience come to life for children. We have all seen our own pet investigating something that only they could see. Muffin is no different. Children will love to go through the pages of this Muffin book and guess what Muffin sees in the corner. This is a book that you don’t want to miss. What’s in the Corner? A Muffin “Tail” is a book that will charm all children who read it or have it read to them. Laura Eckroat was born and raised in Whiting, Indiana. After living in Colorado, Georgia and Massachusetts, she now lives in Fort Worth with her husband, Stephen, and Muffin, the estimable Anatolian Shepherd rescue dog. Laura Eckroat is a school teacher in Texas. Her daughter Ashley attends college nearby, so they get together often. 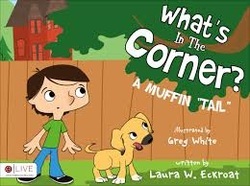 Previous books by Laura are The Life of Bud, A Simpler Time and Went Out to Get a Donut – Came Home With a Muffin. The Life of Bud won the 2010 NTBF Book Award and A Simpler Time was an Honorable Mention in 2011. This lovely story of the cycle of life depicted by a bud, named Bud, on a Mighty Oak tree. It provides a wonderful explanation of the universal cycles of life that small children will understand. Bud learns from his friends on the Mighty Oak tree and thinks about what is happening to him and about his experiences. He goes through his life with acceptance and wonder as he changes from the small brown bud to the beautiful green leaf of summer and the end of his days as a glorious colored leaf of fall. But his use does not end there. You will have to read the book to learn what happens. Children will ask you to read this book over and over until they can read it themselves. They will easily see the parallel between the little ‘bud’ and their own lives. Parents will want to refer to it during many aspects of their child’s growth and discovery. A. J. begins a summer that she thinks will be boring and no way to have adventures like her friends who were all going to exciting places for their vacation. But her Mother has other ideas. She plans some simple activities that makes A. J.’s summer more than just hanging around the house and more fun than she could have imagined. The simple things they do give them something to enjoy together and gives A. J. an opportunity to learn about nature in an exciting and fascinating manner. Laura Eckroat, author of The Life of Bud, has written another book that children will love. Her story makes us want to go out with our children and look for four leaf clovers and find some lightening bugs to show us the way to A Simpler Time. She shows us, in a wonderfully charming way, that the adventures in the back yard can be more fulfilling than any vacation away from home and that modern technology is not the only way to spend time. A Simpler Time is an Honorable Mention presented at the NTBF Awards on April16, 2011 at the North Texas Book Festival in Denton, Texas. Went Out to Get a Donut – Came Home With a Muffin is a lovely little ditty (her description) that Laura Eckroat has written about Muffin. Who or what is Muffin? What a mystery! You have to read this story to find out the answer. Children will love to sing along to this delightful story. Be sure to download the audio of the book, as Ms. Eckroat narrates it with the fun and enthusiasm that it deserves. Children will delightfully sing along with her after the first time they hear it. I, personally, would like to taste some of those donuts as I follow Ms. Eckroat to the end of the story. Of course, then I would like to have the Muffin in the end. A cinnamon, sugary, tasty donut. The illustrations by Greg White are colorful and descriptive of the story. Children will excitedly pour through the book, pointing out the different kinds of donuts and follow the trail to the answer to whom or what Muffin is. The illustrations capture the trail to the Muffin in gorgeous color. The premise of the story teaches the value of adopting a pet. Children will learn to love and care for an adopted pet and discover unconditional love in return. Laura Eckroat was born and raised in Whiting, Indiana. After living in Colorado, Georgia and Massachusetts, she now lives in Fort Worth with her husband, Stephen, her daughter Ashley and Muffin, her Anatolian Shepherd rescue dog. She works for the Northwest YMCA and volunteers at the Fort Worth Nature Center. She has been an elementary school teacher and the general manager of an educational toy store. During football season, she roots for “DA BEARS” (Chicago Bears).